We also offer Spanish courses for all levels with an experienced teacher for a price of 12 CUC per person and hour. The price for a course of 10 hours (e.g. 2 hours a day for 5 days) is reduced to 100 CUC per course and person. 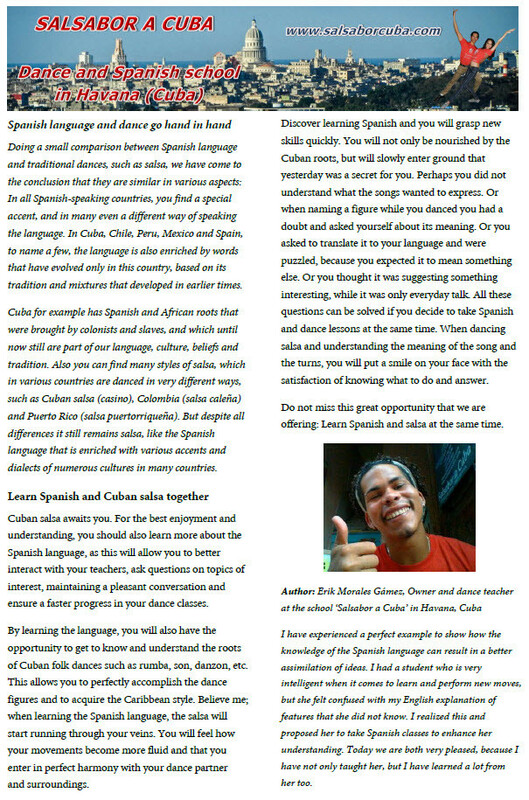 Please find below an article written by Chino (Erik Morales Gámez), the owner of 'Salsabor a Cuba' about how learning Spanish can enrich your dancing of Cuban salsa and enhance your understanding of the Cuban culture. The article was published in a Russian magazine in August 2014 and is available to download and to read it online (in English and Russian).